Personalized Custom Wood Farm Tractor Christmas Ornament. 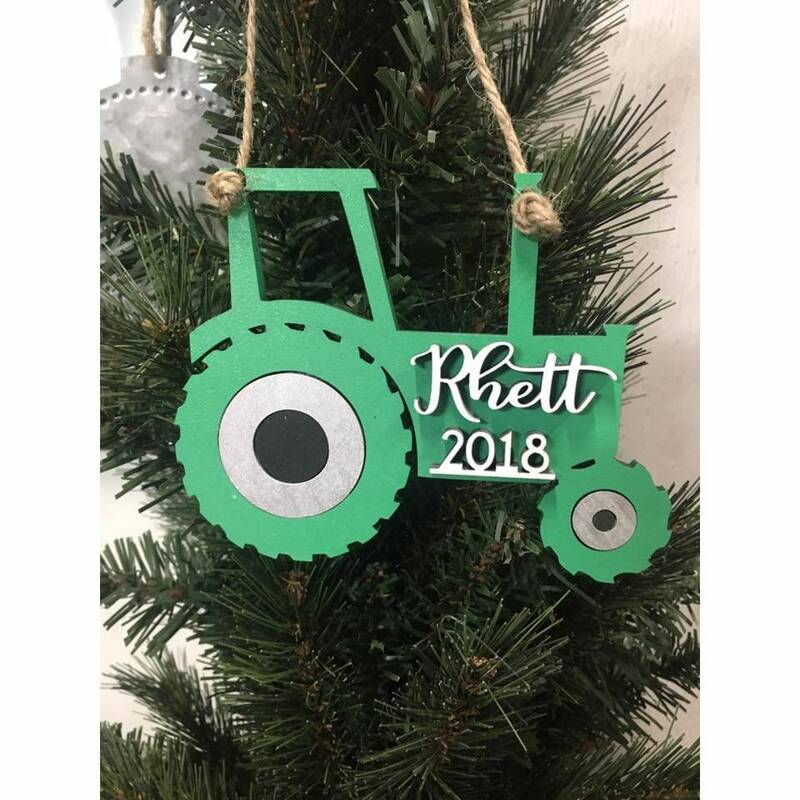 This listing is for a personalized Tractor Christmas tree Ornament! Just let us know the last name in the note section at checkout. Measures about 4.5-5" in length. Please click the link below for current production and shipping times for U.S. & International residents. Convo Southern Ever After to arrange for a rush shipment for $15 extra and we will respond ASAP! Please read our shop policy on returns before purchasing. Paypal or direct checkout with debit/credit cards is accepted. If you need the item even faster please let me know and I will try to make it happen! All items are crafted within 2-3 weeks (unless specified) and ship First Class Mail. First Class Mail arrives within 2-5 business days, so PLEASE ALLOW UP TO 4 WEEKS FOR DELIVERY. All items are crafted and shipped within 3 weeks and ship First Class International. First Class International does not provide tracking information or an estimated time of arrival, so please allow an additional 2-4 weeks for delivery. Please note, all taxes and customs duties incurred on an international order are your responsibility as a buyer. If you need your order to arrive in less than 7 weeks, please convo us first. If you would like to purchase insurance on your order please convo me. I can not be held responsible for any shipping delays once a package has been shipped. It would be great if we could control the Postal Service though, wouldn't it? Please confirm that your address is correct before purchasing. Buyers are responsible any shipping costs of returned and resent packages that are due to the incorrect address. Buyers are also responsible for any customs fees, taxes, tariffs, duties, etc. that may be incurred at the time of delivery. Returns will not be accepted due to customs fees. Due TO The Handmade nature Of All items WE WILL NOT ACCEPT ANY RETURNS OR EXCHANGES OF MERCHANDISE UNLESS THERE IS A MATERIAL DEFECT IN THE MERCHANDISE OR IF THERE IS AN ERROR WITH THE ORDER ON OUR PART. IF THERE IS A DEFECT OR ERROR, YOU MUST CONTACT US WITHIN TWO (2) BUSINESS DAYS OF YOUR RECEIPT OF THE PACKAGE IN ORDER TO OBTAIN A REQUIRED AUTHORIZATION FOR RETURN. IN SUCH EVENT, A CREDIT OR EXCHANGE WILL BE GIVEN. A MERCHANDISE CREDIT OR AN EXCHANGE OF EQUAL VALUE MERCHANDISE OR A REFUND ****ABSOLUTELY NO SHIPPING FEES WILL BE REIMBURSED FOR ANY REASON. WE CRAFT GARTERS BY THE MEASUREMENTS PROVIDED TO US. IF YOU MEASURED INCORRECTLY THERE IS NO REFUND, ONLY IF IT IS ON OUR SIDE. WE WILL NOT EXCEPT A GARTER THAT WAS ORDERED WITH ONE MEASUREMENT FOR ANOTHER MEASUREMENT. **Monogrammed garters or any other monogrammed items can not be refunded after 48 hrs of purchase date due to the nature of this item. IF YOU DO NOT PROVIDE ALL QUESTIONS ASKED ON A LISTING WE CAN NOT BE RESPONSIBLE FOR AN ITEM DELAY. THE ITEM WILL BE SHIPPED OUT AS LISTED. ALL GARTERS WILL BE SENT OUT ON IVORY LACE IF NOT SPECIFIED. If for some reason we do accept a return there is a 20% restocking fee. LOST, DAMAGED OR DELAYED PACKAGES WILL NOT BE REFUNDED. ONCE PACKAGES ARE SHIPPED IT IS OUT OF OUR HANDS AND THE RESPONSIBLY OF THE SHIPPING COMPANY. © 2019 Southern Ever After.